Changes In Attitude, Unique Cypress Home inside Plantation w/ Pool & Hot Tub! Welcome to Changes In Attitude! This spacious first tier home is built with a warm pecky cypress interior and tile floors throughout. 4 Master Suites on the lower level, each with their own TV and private bathroom, open onto the covered wrap-around deck with Gulf views. The top floor great room is spacious and inviting with high ceilings, exposed cypress beams and plenty of seating. Relax with a movie on the large, HDTV with DVD player, unwind with a card game at one of two round dining tables or enjoy a snack at the breakfast bar. Beautiful granite counter tops grace the large, open kitchen and a full-size second refrigerator is available for your convenience. Still have to work while on vacation? We have a dedicated desk space with modem plugin and WIFI. A full bathroom with shower is located just past the kitchen and the top floor wrap-around deck offers panoramic Gulf views and a large furnished, sundeck to enjoy the breeze. A screened-in private swimming pool is located just past our 6-person hot tub, a great way to wind down after a long day at the beach. The community beach boardwalk can be found at either end of the street for easy and quick access to the beach and as guests staying inside the St. George Plantation you will have access to Plantation amenities which include the Clubhouse with fitness center, community swimming pools, tennis and pickleball courts and miles of bike path. Available from June 1 thru Labor Day ONLY, don't miss your chance to stay in this one-of-a-kind beach beauty! Forgotten Shores Properties is a local property management company, available to answer your inquiries and to assist you during your stay. We are happy to be working with the homeowners of Changes In Attitude in management of their SGI home. Read on to learn what makes this property so special as told by the owners. This house is quite unique. Pecky cyprus walls, saltillo tile floors and vaulted cyprus beams in the great room give this house a warm and sturdy feel. The spiral staircase leading downstairs conjures up descending to the lower deck of a ship where four corner "cabin" rooms can sleep eight guests. (Sleeper sofa upstairs.) Original art adorns the walls. The wrap-around decks provide ample space for those shy of the sun to experience the wind and views or just to walk outside on a rainy day. You will get exercise at this house. Be aware there are 21 steps to the first floor where the bedrooms are. There are 16 more steps to the kitchen/great room floor. Steps are not steep but there is no elevator. We received a most personal and warm welcome from the owners who happened to have stayed there the week before ours. But even without their gracious tour, the logistics of the house are pretty straightforward and self explanatory. The location is outstanding. At first we had looked for a property right on the beach. Good thing we went with our intuition when we saw this place. The beach is just a couple minutes' walk away. And while the home provides plenty of privacy, we also actually appreciated it's location in t he midst of a a community, giving it almost a village feeling and the opportunity for the kids and adults to socialize and meet people, should they so desire. The home is simply perfect -- anything you could want is there and it has great charm, lots of wood throughout. The interior is very specious, affording everyone plenty of privacy. Conversely, the open floor plan of the top level creates the perfect single large social area for cooking, eating, watching TV, lounging, playing board games, hanging out on the deck and simply watching the ocean or the stars. 3 nice wet options: the ocean, the refreshing pool protected against insects, or the perfect hot tub. The gated community is great -- very quiet, lots of interesting homes to look at as we hiked and biked along the beach as well as little dead end-roads connected by walkways -- safe for kids, no busy thoroughfares. All in all this was the perfect combination of plenty of activities along with intense relaxation. The perfect weather helped. The price seemed right and very favorable compared to other properties we had considered. Downsides: A real grocery store is about 20+ minutes away by car. And there aren't many attractions (to our liking) nearby. But that was the whole point of the vacation: to relax and enjoy the beach and the rental. Had a great time. 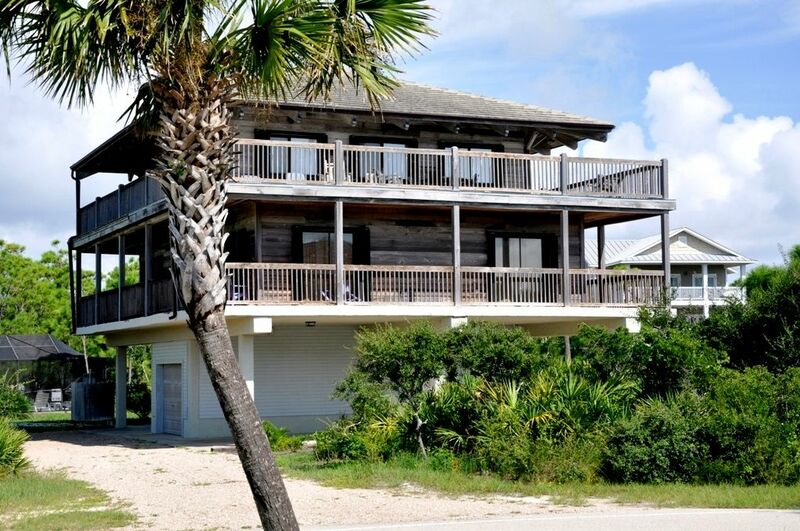 Beautiful classic Florida beach home, solidly built, and with great views of the beach. New owner who is very accomodating and interested to receive feedback and make improvements. Four bedrooms with queen sized beds only. Our only concern was that there needed to be one room with twin or bunk beds to accomodate smaller children. Kids don't always stay up as late as the adults and having them sleep on the couches in the main room didn't work out so well. Other than that there were no other issues. Highly recommended.